When the warm days of summer come to an end and school is back in session, families are often limited to short weekend escapes or day trips — but they can be just as fun and relaxing as week-long escapes, especially in the fall. Want to get out and enjoy this year’s fall foliage? Hop aboard one of these short and easy train rides for leaf peeping. In the mountain town of Blue Ridge, Georgia, experience the fall colors of the Chattahoochee National Forest on the Blue Ridge Scenic Railway. The one-hour journey begins at the 1905 historic depot, where visitors board a vintage, climate-controlled or open-air rail car. 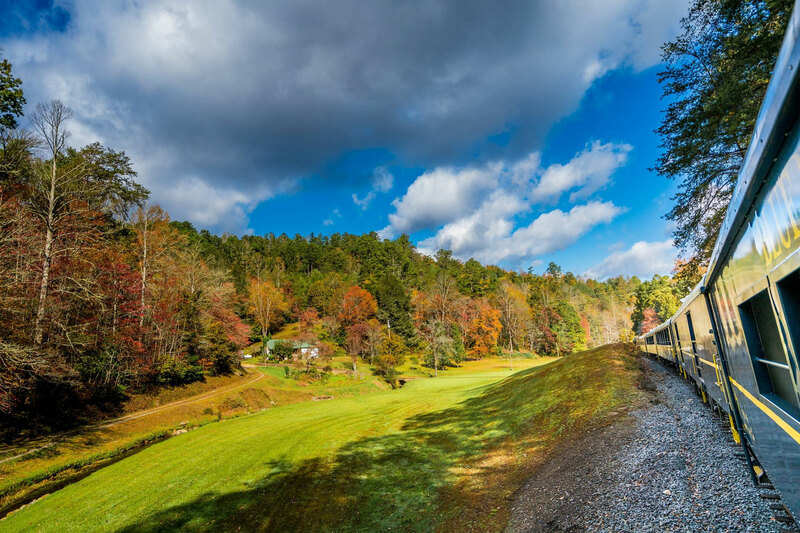 The 26-mile train ride winds along the Toccoa River, passing by a colorful canopy, and then stops for a two-hour layover at the state line sister towns of McCaysville, Georgia, and Copperhill, Tennessee. Here, families can grab a bite to eat, indulge in ice cream, shop, and see the sights before the trip back. 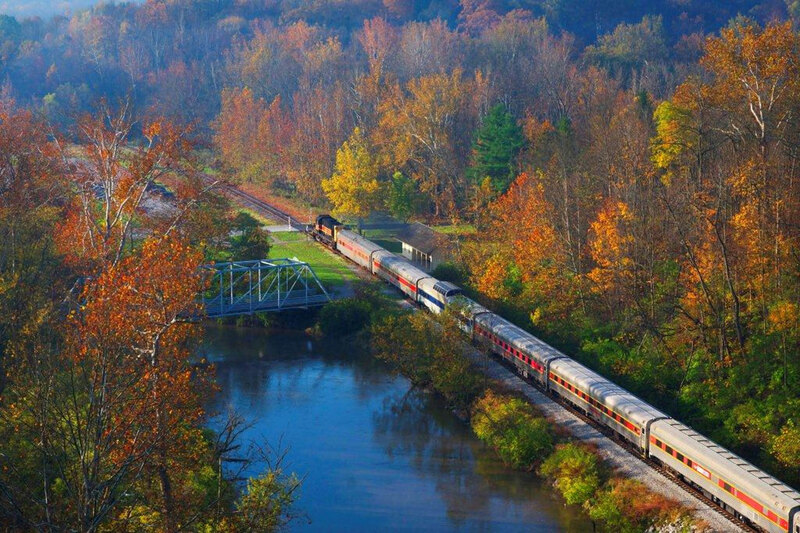 A ride on the Fall Flyer with Cuyahoga Valley Scenic Railroad offers a unique way to experience the vibrant colors of Cuyahoga Valley National Park’s 33,000 forested acres. The two-hour nonstop train excursion departs from two locations: Rockside Station in Independence, or Akron Northside Station, in Akron. The heritage train includes new Zephyr cars, and families have seating options that include spacious private suites with two windows and an observation car with a glass-enclosed upper dome for panoramic views of the park. 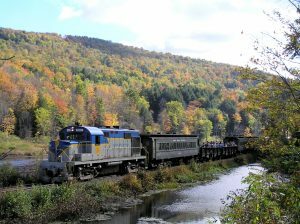 For five weeks each fall, Green Mountain Railroad offers a three-hour fall foliage train ride. The 30-mile, round-trip journey beings in Chester, Vermont, and makes its way up the track to the colorful vistas at Summit, crossing a high trestle with mountain views along the way. Throughout the journey are historical narratives about the railroad, as well as information about the changing of the leaves and Vermont’s maple syrup industry. There are also activity sheets and games for children. Lunch is available for purchase with “Little Engines” meal options. Every fall, Arcade & Attica Railroad takes riders on a two-hour fall foliage ride in a WWII-era steam train. The journey begins at the depot station in Arcade, New York, where visitors can tour the small railroad museum. 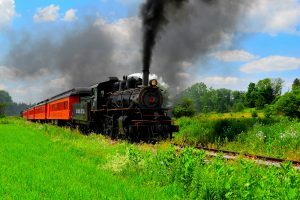 Once en route, riders are shown the area’s scenic countryside with farmlands and bright fall colors as they make their way to historic Curriers Station for donuts, hot dogs, chili, and cider, before the return trip. Secret Valley Natural, Recreation and Heritage Area is known as the “best fall foliage in Pennsylvania.” The two-hour Autumn Splendor Fall Foliage train ride with Colebrookdale Railroad Excursions takes riders on a train restored to the golden age of railroads, including an open-aircar. The ride begins in Boyertown, Pennsylvania, and views include glens, streams, and vibrant colored forests. Fare options include an Edwardian-style deluxe coach car or dining car that serves autumn themed-snacks and cider, as well as brunch on certain days of the week. 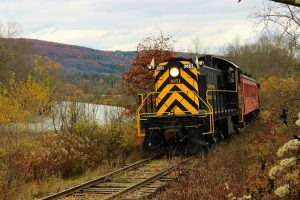 Built in 1869, the Cooperstown and Charlotte Valley Railroad offers a fall foliage tour in upstate New York. 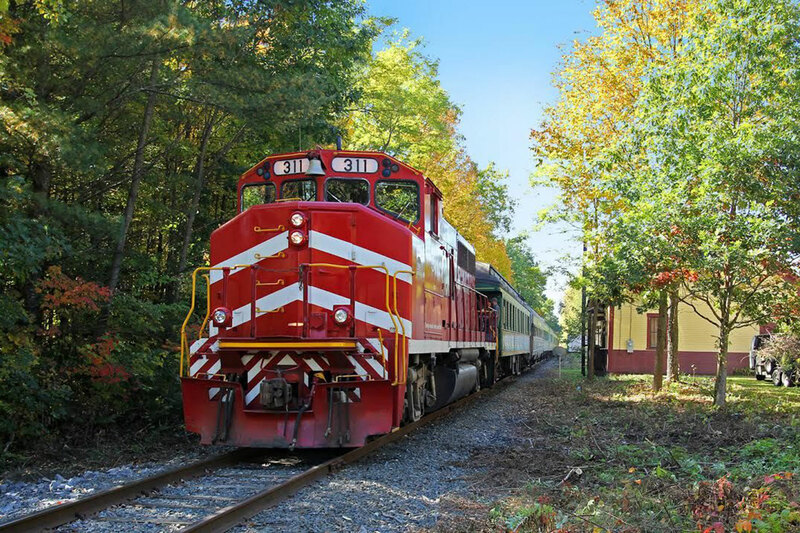 The journey begins at Milford Depot in Oneonta, New York, and the 2.5-hour ride takes passengers through the Susquehanna River Valley with rolling hills, farm fields, and dazzlingly forests. Snacks are available for purchase, as is an open-air car for panoramic views. 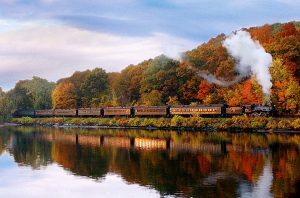 Enjoy the blazing colors of autumn in the Catskill Mountains on the one-hour excursion train with Delaware & Ulster Railroad. The journey begins at the historic 1871 Arkville Station, where passengers board vintage coaches pulled by a diesel engine. The scenic route includes 10 miles of prime fall foliage viewing along the Delaware River. There are open-air cars, and snacks are available for purchase before the journey. Families interested in a sit-down lunch will want to ride the Rip Van Winkle Flyer. 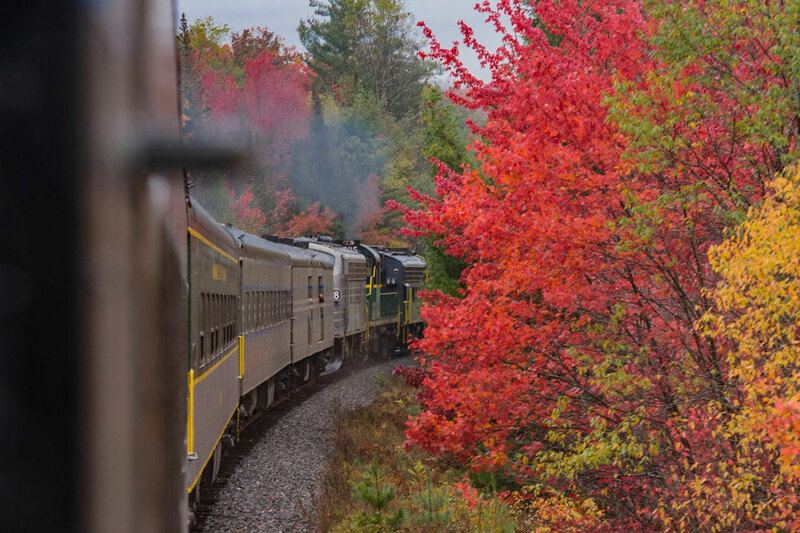 The fall foliage ride on the Adirondack Scenic Railroad is an all-day experience with a long layover in the town of Old Forge. The journey begins in Utica and takes riders past rivers, lakes and picturesque wooded landscapes. Once the train arrives in Old Forge, guests can opt for a lake cruise or shopping and dining in town before the return trip. 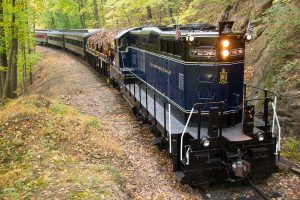 In Essex, Connecticut, the 2.5- hour fall foliage excursion with The Essex Steam Train & Riverboat begins with a 30-minute train ride, followed by a 1.5-hour riverboat cruise on the Becky Thatcher to the Haddam Swing Bridge and back. The trip is around 20 miles and shows off the splendor of the Connecticut River Valley and its wildlife, such as eagles, osprey, and swallows. The train features coach cars, as well as options to upgrade to first class, open cars and on weekends, the caboose. 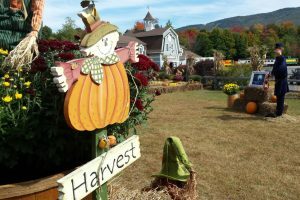 Every fall, the Hobo Railroad makes a special route to view the fall foliage of New Hampshire’s White Mountains with the Harvest Time Express. The nearly 1.5-hour train ride departs from Lincoln, New Hampshire, and guests can nibble on treats such as pumpkin granola and cider while viewing Mother Nature’s autumn palette. Back at the station is “Cornstalk Critters,” a display with themed scarecrows, pumpkins, antique tractors, and games for families.